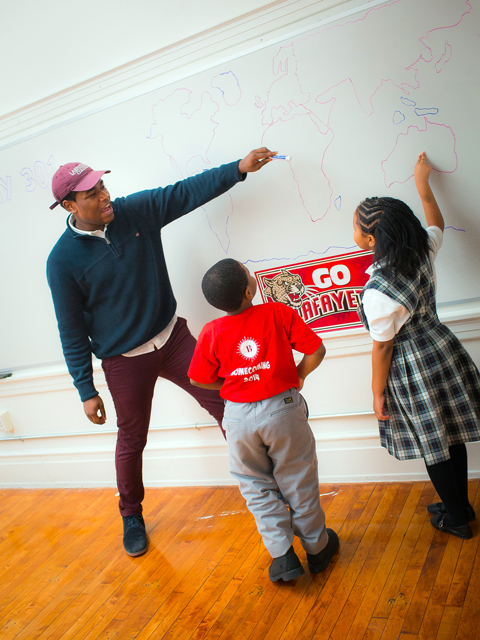 Jethro Israel ’16 leads students in a “Name That Country” game during geography class. In a classroom down the hall, Marisa Ferraro ’16 and Joanna Scotti ’17 kicked off the government class they were leading with a lively game about the role of the three branches of the U.S. government. After that, they asked their second-grade students to complete the sentence, “If I were president of the United States, I would….” The answers ranged from the lofty to the lovely: “Take away guns,” “plant more flowers,” and “invent hover shoes” were some of the most memorable. Marisa, a psychology major and the project leader, had suggested Lafayette’s Alternative School Break tackle a project that explored how inequities and urban poverty impact education. Marisa Ferraro ’16 led the student team. Abby Williams ’15, president of ASB, had an idea: She was fresh off an inspiring internship with William E. Simon & Sons investment firm and its William E. Simon Foundation, whose main mission is to help inner-city youth and families gain access to education and community-based services. During that internship, Abby—a policy studies and neuroscience double major—had accompanied Simon & Sons co-chair Peter Simon ’75 to Brilla. Impressed with the school’s philosophy, energy and academic outcomes, she suggested the prep school to Marisa and the rest of the student team. Before arriving at Brilla, 10 students spent time with Lafayette alumni who had led similar ASB projects in New York to learn more about the issues. The team then developed lesson plans from courses they’re majoring in, or are just plain passionate about—everything from world geography and drama to cultural art and biology. Then they worked with Brilla’s founding Head of School Aaron Gillaspie as well as several teachers to adapt those plans to the ages of the Brilla students. Then, after several days of assisting and shadowing the teachers, they put those plans into action and led classes themselves. Emma Sherry ’18, a government & law and American studies double major, explains the three branches of American government to the students. “I’m very interested in education as a tool to level the playing field and address social justice issues,” says Emma Sherry ’18, who majors in American studies as well as government and law. The educational model at Brilla, she says, can make a real impact in the lives of disadvantaged children in urban centers throughout the country. For Marisa, the rewards garnered from helping others and giving them a glimpse into the college life went far beyond what she could have experienced during a typical winter break. 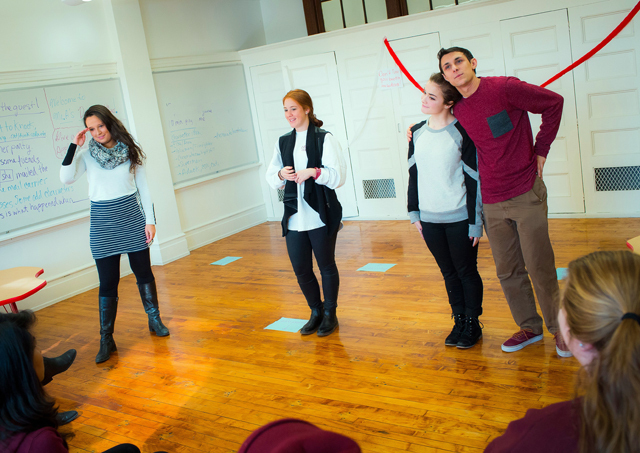 Stephanie Roman ’17, Joanna Scotti ’17, Marisa Ferraro’16 and Matt Ackerman ’18 educate and entertain during drama class at Brilla. That’s all the more inspiring because many in the South Bronx school come from some of the poorest homes in the metropolitan area. Despite their financial challenges, the school’s students are high achievers. Brilla was ranked #1 in New York State on the National ANet Math and ELA Assessments. Because it is in such high demand, admission to the school is through lottery. 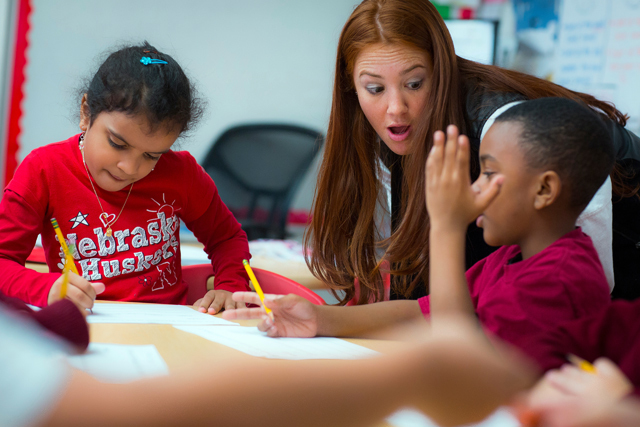 To help reach more students, Brilla plans to add a grade each year until it serves kindergarten to grade 5. Brilla’s philosophy includes clear-cut goals for students, a curriculum based on research, blended learning, and differentiated instruction. That philosophy is put into action by passionate and innovative teachers. 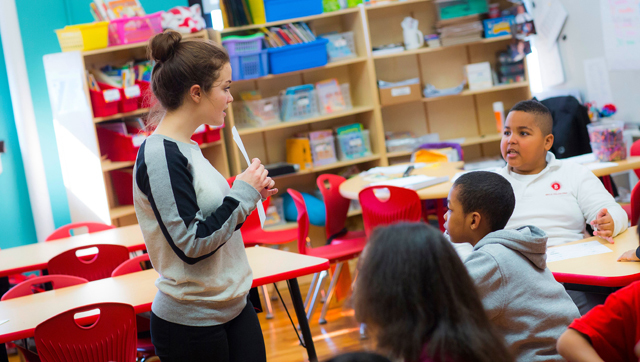 Joanna Scotti ’17 teaches students about the U.S. Government. The school’s students are held to high standards of intellectual curiosity, self-control, courage and kindness, but fun is big here too. “The day starts with a morning cheer—each class has their own that they’ve created—and teachers give shout-outs to students and other teachers for jobs well done,” says Joanna Scotti ’17, who majors in policy studies, as well as film and media studies. There are also brief but frequent activity breaks throughout the school day to get the wiggles out—karaoke, a quick dance routine, more cheers, and hugs and high-fives all around. Marisa and the rest of her ASB group were so moved by the experience they plan to pay close attention to names of Lafayette’s incoming class of 2027. They’ll scan that list for anyone they recognize from among their standout students at Brilla. And they’ll be right there to welcome those young men and women to the same rich tradition of learning and caring that members of the Lafayette team now experience for themselves. Maybe you feel inspired to act after reading this. Then perhaps this also makes this a story about you: Why not consider taking part in an ASB yourself? Every kindergartener at Brilla College Prep can tell you what year she’ll be heading to college (it’s the year 2027). And each classroom at Brilla College Prep is named for an individual college or university. But the only way for a college to win this honor is to send school gear—lots and lots of school gear. T-shirts, pennants, banners, pencils, even old tchotchkes will do. All these items come together in displays of cacophonous celebration that festoon the classrooms and inspire young scholars. 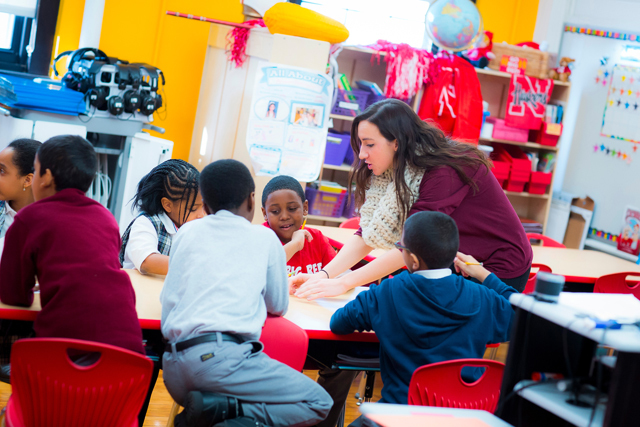 You can help create a Lafayette classroom! Donate Leopard swag by sending it to: Brilla College Prep, 413 East 144th Street, New York, NY 10454. Hello, I am prospective lafayette student. Can just any student join the ASB, I mean, if i do get into lafayette, I think I would want to participate. It would be truly wonderful if all of these Lafayette students would be inspired to enter the teaching profession which is in dire need of competent and dedicated teachers even though it would have serious economic effects on their personal finances. It is disgraceful that people who teach do not receive the remuneration and respect they deserve. My name is Marisa Ferraro and I was the team leader for this trip. You’ll be happy to learn that next week, I am beginning a Master of Arts in Teaching program through Quinnipiac University in CT. ASB trips like this one to the Bronx and other trips that gave me the opportunity to serve in a school really helped me to discover that teaching is the right path for me. I’m very excited to begin my journey as an educator and hope that I can make a difference to children!